I’m exploring dairy- and citrus-free dessert options for when boyfriend’s dad visits next month. 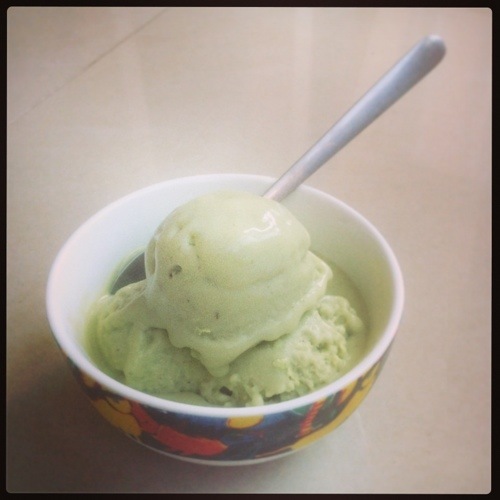 My first experiment, avocado ice cream made with coconut milk, turned out to be a winner. I used David Lebovitz’s recipe, which struck just the right balance between the two really rich flavors of avocado and coconut, resulting in a light but creamy dessert that is perfect for summer. The bowl below was scooped straight from the ice cream maker, which is why it started to melt so quickly. Avocado as an ice cream.